One man is dead and a woman is in hospital in critical condition after a car crash in the city's northwest early Tuesday morning. 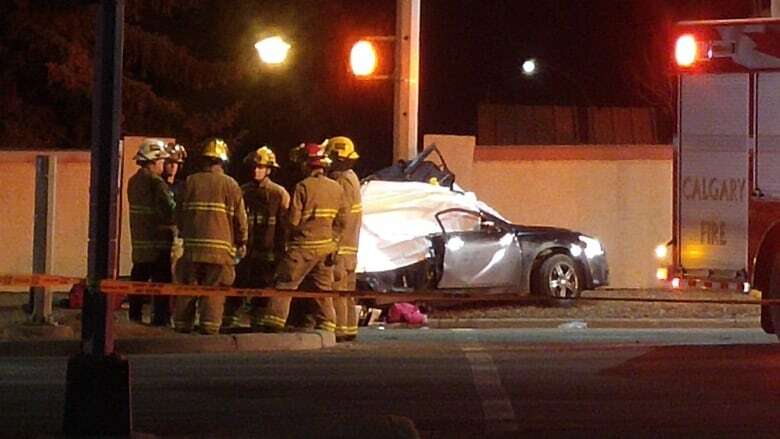 The single-vehicle accident happened around 4:15 a.m. at 14th Street and Macewan Drive N.W., an EMS official said. Calgary police say the driver lost control of the car, a Nissan Maxima, which spun out and hit a streetlight on the northeast corner of the intersection. The crash killed the driver of the car, a man in his late 30s. The passenger, a woman in her early 20s, was taken to Foothills Hospital in life-threatening condition, according to a news release from the Calgary Police Service. Excessive speed is believed to be a factor in this collision. Alcohol use on the part of the driver is being investigated as a contributing factor, police say. Fourteenth Street was closed to northbound and southbound traffic between Berkshire Boulevard and Sandarac Drive N.W. until about 12:45 p.m.